Hadassah National President Marcie Natan and a group of Hadassah leaders from the US flew to Israel on July 27 for a brief, but intense, tour of specific areas in Israel affected by Operation Protective Edge. 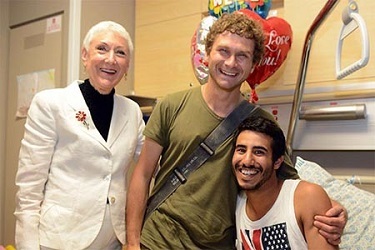 Reunited at the Sarah Wetsman Davidson Hospital Tower: Wounded soldier Natanel Lulai, 21, and Hadassah ER physician and IDF soldier Dr. David Rekhtman. The doctor treated Lulai when he was wounded in Gaza. Marcie Natan was there to share the emotional moment. At the Sarah Wetsman Davidson Hospital Tower the group was briefed by Khaled Abu Toameh, an Arab Israeli journalist, on the current Arab world situation. After visits to soldiers who are patients and the underground operating rooms, still waiting to be completed, they traveled to the Knesset, where they were briefed by MK Gila Gamliel, member of the Finance Committee. As they traveled to Har Herzl to visit the graves of newly buried soldiers, they were saddened to learn that 3 additional Israeli soldiers were killed this morning. After reciting the Prayer for Israeli Soldiers and the Prayer for the State of Israel, they prepared to leave Israel. At the end of the day, the group visited with Israel’s newly installed tenth President, Reuven “Ruby” Rivlin and his wife Nechamah. President Rivlin was pleased to be welcoming the Hadassah mission, stating that he strongly believed in Hadassah and thanked them all for their contribution in creating the health system in Israel. The President and his wife were both proud to report that they each had an aunt who has been active in Hadassah for many years.